Intel chief executive Paul Otellini answers your questions about the future of computing and the chip making firm. 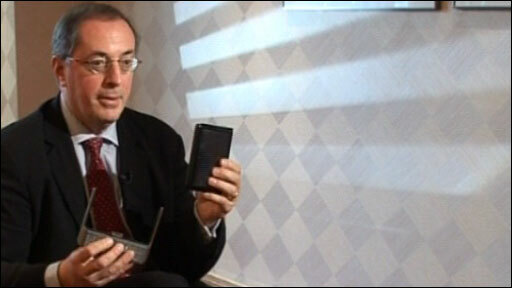 BBC News Technology correspondent Rory Cellan-Jones put your questions to the firm's leader. Q: The first question comes from Bill Currie, in Hong Kong. He asks if we really need all the power in today's computers? Paul Otellini: The PCs that we're using today are 32 times more powerful than the ones we first started with. I've been in this industry long enough to remember when we first brought out the 286, someone said, who needs all that processing power - what are you going to doing with it? And then a generation later, it was, I need a 386, then I need 486 and a Pentium. I think the real simple answer is that the applications; the things that we're going to do on computers continue to need more and more performance - more and more compute power to be able to give us what we need. And it's not so much it will run your spreadsheet any faster, it's that the Web is going to become increasingly immersive, increasingly visual, increasingly graphics intensive - increasingly photo-realistic kinds of things for social networking. The kinds of applications that you'd like to have to that will make PCs easier to use also need more performance. For example, speech - wouldn't it be great to be able to talk to the computer, have it understand you and have it do what you want, as opposed to typing or any other kind of interface. That takes far more than 32 times more performance than you have today. Q: Now, Cameron Solnordal, in Melbourne, Australia takes that on a bit and says what kind of computers do you envisage being used in 10 to 20 years time, if Moore's Law continues? Will the devices themselves change radically? Paul Otellini: The cell phone will get smarter and smarter - I think everyone accepts that they're going to become nothing more than a very portable computer - that requires more performance. So I see the computers of tomorrow just taking everything that has electronics in it and allowing those machines to have internet access. So your automobiles, industrial control, your phones, your home heating systems will all be connected to the Web to allow you to either gather information from them, to run them more smartly, or to become just much more efficient. 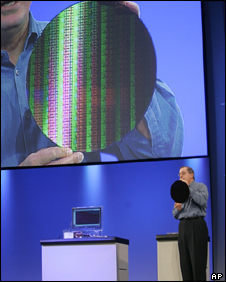 Q: We've got a question about the Atom chip from Lee Setford, from Portsmouth, Hampshire: With increasing focus on the green aspect on computers, do you believe that Atom competes with the latest super energy-efficient processors in terms of price and performance? What's that going to do - what's the importance of that? Paul Otellini: Well Atom is aimed at a whole new class of applications and new class of machines and it's the first time we've ever really done a product that's power optimised for these new devices. Q: Can we have a look at one? Paul Otellini: What we've done here is we've designed something that has very good performance; it's about as fast as the fastest laptop in the world was just a couple of years ago but very low power, so it saves energy, it goes into low-cost devices - it will also go into handheld devices. Should Intel be forced to share knowledge with AMD? Q: Let's move on to the competitive field that you're in. Neil Dowdall from Holland wonders whether the current situation in the market is healthy - Intel is so far ahead of AMD in terms of technology and price that one could say it's a monopoly like Microsoft. Should you, Intel, be forced to share knowledge with AMD? Paul Otellini: I don't think so. His observation is correct, his memory may be a little short though. A couple of years ago we were being criticised for being behind them and one of the things I've seen in this industry over three decades is that there's a lot of giving and taking in terms of competitive lead and in the semi-conductor industry participants never take their position for granted - if you did you'd be out of business. Q: Another question on competition - new competition - John Wayne, from Llanharry, Mid Glamorgan: Are you worried about Sony's cell chip challenging your dominance of the market? Paul Otellini: As they would say, it's interesting architecture. It's a many-core architecture. The problem that I see with that architecture is two-fold: the way it requires a whole new set of applications and it's a very difficult architecture to program. Q: On the wider economic background, of course hard times in America at the moment. Gonzalo Zavala from London asks: How do you expect Intel will be affected by a recession in America? How do you expect Intel will be affected by a recession in America? Paul Otellini: Well, 75% of our revenue is not in the US today. Q: The global economy is not looking that brilliant either is it? Paul Otellini: Well, it's not bad. It may not grow as much as fast as people thought it would a year ago for 2008 but much of our sales in the last few years and much of our sales growth have been in emerging markets; in China and India, South East Asia, Latin America, Eastern Europe, the Middle East. I don't see those going into any kind of recession - at least I haven't seen any projections of that so far. Q: John Riley from Northampton in England asks: Why can't PCs turn off and on, just like a television does? Do they have to keep going through that boring boot-up which takes ages? Why can't PCs turn off and on, just like a television does? Paul Otellini: I don't suppose I could tell him to ask Bill Gates that question! Quite seriously - I don't re-boot my machines anymore unless there's a reason - a new application I want to load or something or an upgrade kind of thing. My laptop turns on and off like a television - when I want to use it I open the lid and it is there - it wakes up - and I close it when I'm finished. That's the way they should be and that's the way they are today. Most people don't need to re-boot their machines every week or indeed every hour. Q: Neil Moss, from Edinburgh asks: Why does my two Gigahertz dual core PC take longer to open my email and word processor than my machine of 10 years ago, which ran at 1/200th of the speed? He again thinks modern software has slipped into, what he calls, a do less with more ethos. Paul Otellini: Without knowing what he's running on that machine, it's pretty hard to diagnose it. Q: But don't you think that is a common theme? Q: There is frustration amongst a lot of users that they are getting more and more powerful machines that don't necessarily do things that much better than they did 10 years ago. Paul Otellini: I disagree. Take what people do today - I don't know if you have children, I do - my daughter spends all of her time with photographs, with videos and so forth. You couldn't even run those on a PC of five years ago. You want to do some photo editing - try doing that on a five year-old machine versus a dual core machine. Q: Now we've got a couple of questions about Wimax which of course is a technology which has promised much but not delivered a lot yet in terms of giving people access to broadband over a wide area. They're both from the developing world. Philippe Thai from Phnom Penh in Cambodia, and Rawaz Rauf from Iraq. They both really want to know what Intel's investment in Wimax is going to mean for them - whether it's going to bring big changes? Paul Otellini: We're incorporating Wimax into notebook starting this year. It starts going into handheld devices, starting next year. There are 120 deployments around the world today - it is starting to move as countries and cities are starting to get populated. So I think you'll sit here a year from now and you'll have tens of millions of subscribers and you'll move to hundreds of millions of subscribers say two years later than that - that's pretty good. Q: Femi Alla from Lagos, Nigeria wonders why they haven't heard more about the Classmate which is your rival to the one laptop per child project. Is it going to go any further than the couple of schools where she says the concept was demonstrated and which gave both projects a lot of media exposure? Why haven't we heard more about the Classmate PC? Paul Otellini: We are quite happy with where we are at; we're now in our second generation of the product - there are a lot of large contracts. At the end of the day though, this is really focused on getting school districts affordable computing and that gets down to budgets and how fast people want to deploy them. I'm happy with where we are with the product. Q: Nicolas Negroponte who runs the one laptop per child project has been very harsh about Intel's attitude, claiming that you acted in bad faith and basically attempted to drive them out of countries like Nigeria. What do you say to that? Paul Otellini: I think I've used this word with your network before - I think it is hogwash. We didn't do anything that drove him out of anything. We competed fairly for the business and it is a different computer model. The two basic machines are approached, dealing with the problem of getting children laptops, differently. Ours is focused on working with teachers and having a teacher-driven education environment. OLPC is focused on, give the kids a laptop, turn them on to the internet and let them go. We happen to think that the teaching model that works for teachers is a better model. Our laptop ships with teacher-control software; so teachers can control what the kids are doing in class and be able to manage the process. It's a whole different thought process. Q: Do you think their model will survive? Can both models survive? Paul Otellini: I don't see why not; we're having some success with ours and they're having some success with theirs. I think it gets down to what do the school districts want to do and when a school district chooses one versus the other, it doesn't mean that the other one is wrong, it just means that they've made a different choice in terms of the education profile they want to apply. How much longer do we have to listen to that incredibly annoying anthem every time someone mentions an Intel chip? Q: Moving on to one slightly quirky question here: Chris Barker, in Otley, West Yorkshire: How much longer do we have to listen to that incredibly annoying anthem every time someone mentions an Intel chip? Paul Otellini: Well I'm quite fond of it. So as long as I'm around I think we'll listen to it. Billions of people around the world have heard that bong and it identifies commercials with the company that is providing the technology inside it and I think it's a very effective campaign. Q: A couple of personal questions: Ibrahim Faisal from the Maldives wants to know about your personal technology. What kind of laptop do you carry? Paul Otellini: It depends on what I'm doing. I've got a Centrino Pro machine that I carry around with me for business and I've got a Mac I use for my photos at home. Q: Are you equally comfortable with both? You must have a difficult line to tread on the Mac versus PC battle these days. Paul Otellini:Not really. Both sides are customers so we're quite happy with that and actually I've enjoyed learning how to use a Mac, it's something I never did in the first part of my career and it's nice seeing what both sides can do because I do different things with different machines. Q: So it's a Mac at home, PC at work kind of split is it? Paul Otellini: Yes because our corporate environment is all PC-based and the technology we've embedded into Centrino Pro, includes security and manageability features that I think are very important for enterprises like Intel. Q: What about your email? How in touch are you? Paul Otellini: Oh, I'm 24/7. Q: Is it BlackBerry? Is it on your phone? Paul Otellini: I've a BlackBerry. Most of it I do on my laptop because the BlackBerry is nice when you're walking down the hall or something but given the amount of email I have, I need a pretty good keyboard to be able to keep up with it. Q: Do you ever feel that you'd like to be disconnected from the internet for 24 hours? Paul Otellini: No. I am not one of those people. It's pretty hard for me to disconnect from my job for 24 hours let alone the emails. Emails are the way we run the company; it's the way I talk to friends and customers, so it's something that I like to do. If I go away for the weekends sometimes, I may turn it off - but not too often. Q: You're an addict, would you say? Paul Otellini: I don't think so - maybe all addicts say no but I don't think so because it's my choice at the end of the day. Q: Finally, Wes Ramsay from Tennessee in the United States wants you to look to the future and say one day you'll retire, what professional accomplishment will you look back on with the greatest sense of satisfaction and what about a personal accomplishment? Paul Otellini: I'm not done with my career yet, so it's hard to project what you're going to be most proud of. But to date, I think I'm happiest with the fact that I've been at a company for 34 years now that has changed the world inside the timeframe of my career and I've had something to do with that. It's not often that corporations can say, with legitimacy, I changed the world because of what I do the world's a better and different place.